providing services within community settings, with material addressing early intervention, early childhood, school-age services, and transitions. The context of this text is rooted in best practice principles from interdisciplinary literature and illustrates how occupational therapy professionals implement those principles in their everyday practices. New Features of the Second Edition: " Updated assessments, evidence, and appendices " Case studies that illustrate the implementation of ideas in a practice situation " Worksheets that outline each step in the occupational therapy process from what to include to how to provide rationale for team members, families, and consumers " Tables and inserts that summarize key points " Information regarding state and federal legislation to guide the occupational therapists in how to negotiate for best practice services within parameters of regulations " Integrated throughout the text is the American Occupational Therapy Association#x19;s Occupational Therapy Practice Framework " Additional on-line resources that are available with new book purchases Instructors in educational settings can visit www.efacultylounge.com for additional material to be used for teaching in the classroom. 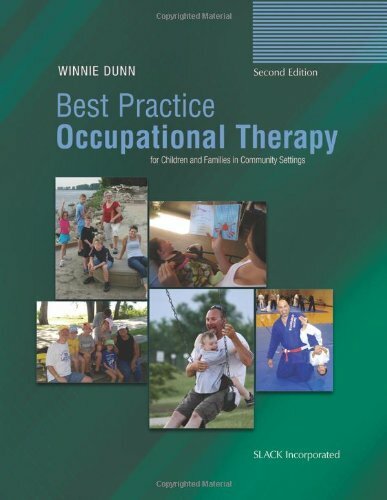 Best Practice Occupational Therapy for Children and Families in Community Settings, Second Edition contains many suggestions about how to practice the skills needed for evidence-based practice, making this the perfect resource for occupational therapy students, faculty, and practitioners who serve children and families.